Another year has passed and now we anxiously await the beginning of another one. 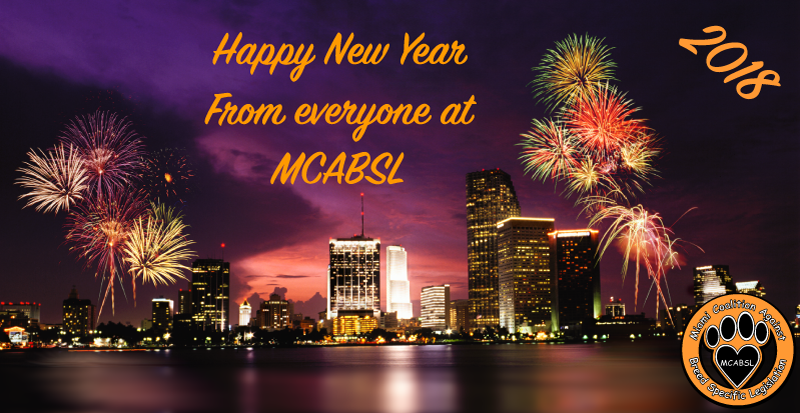 MCABSL has once again made history in 2017 by continuing to fight BSL in the nations stronghold for BSL, Miami-Dade County, Fl., against all odds. We have taken the ultimate approach in this on going battle by filing a law suit against the county to finally eradicate the infamous Miami Pit Bull Ban. This is not only a daring move but the only alternative left to us by the county. Years of negotiations and political unrest paved the way for education and awareness at the highest level. While most of the Miami-Dade County Commission, councils, legislators and representatives all are in agreeance that this ban serves no purpose, the legal ramifications impede the process of its removal. Therefore, we stand alone, with minor assistance from any major animal organization backing us up, whether financially or publicly. I’ve been told, the whole world is sitting and watching, however, this does not help our cause. We at MCABSL do not sit around and watch, WE ACT SWIFTLY UPON OUR PROMISE! It is our dogs whose lives are at stake here. Nevertheless, it will be up to us to fight the good fight in 2018. We will not be intimidated, nor will there be any lack of strong legal representation. However, the financial aspect is up to you! This promises to be one of the most expensive law suits in the history of this county! We need you! In the coming year we will advise of how your contributions can be made. So with this my dear friends, I bid good-bye to 2017 and welcome 2018, as the year history is made in Miami worldwide! Wet kisses for your doggies and Happy New Year! Be safe.God Bless.